LIGHTS OUT! Geoffrey LaRose (right) releases one of many missiles from downtown Sunday night at the Independence Boulevard Court in Albouystown in the opening of the Mackeson 3×3 ‘King of Rim’ Basketball Challenge. grand fashion with Rim Kings’ former national junior guard, Geoffrey LaRose, shooting his way into the next round of the massive basketball competition. LaRose’s team topped the opening group with four wins, the only team to reach the winning 21-point score once, against the backdrop of an awesome shooting display from beyond the arc that counts for two points in the three-on-three format. Rim Kings began their sojourn when they easily brushed aside Rockers 19-9 in the game, which lasts for 10 minutes except in the case of a team reaching the benchmark 21 points. Rim Kings in their second game beat Rim Rockers 16-6 with Samuel Thompson playing on the rim and in the air, using his height to his advantage. The balanced unit then beat the group’s runners-up, Target 21-17 with LaRose catching fire in an intense contest after being down 4-7; LaRose shot his team out of deficit, and to victory, spotting up for huge shots that earned him the respect of the supporters of the Albouystown-based, Target in arguably the best game of the night. To remain unbeaten, Rim Kings then beat Knights 11-7, advancing to the next round, which will be played at California Square, Thursday night. They have advanced along with Target that beat Rim Rockers 17-10 and Knights 6-5; they also gained a walkover from Rockers that pulled their own after losing their first two games. Target finished with three wins and a loss to end second in the group. Knights had two wins and two losses after beating Rockers 10-7 and Rim Rockers 11-4 to finish third with Rim Rockers in the cellar position with one win from four games and Rockers no wins. 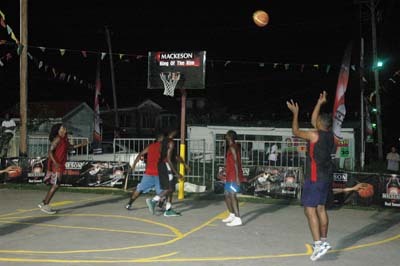 The competition opened Sunday night with Mackeson Brand Manager, Jamaal Douglas and the Guyana Amateur Basketball Federation (GABF) President, Nigel Hinds meeting the teams, and offering words of encouragement before the official ‘jump-ball’. The competition heads to Plaisance tonight for the East Coast zone from 7pm with teams coming from Berbice, Melanie, Buxton, Plaisance and University of Guyana to play for the one spot that is up for grabs in that zone of the competition.